Part 1 of Windows XP Mode in Windows 7 and Virtual PC. Windows Virtual PC is a new optional component that you can use to migrate to the Windows 7 operating system while maintaining compatibility with applications that run on older versions of Windows, such as Windows XP. This article summarizes the concept and demonstrates the steps required to enable XP mode. If you run Windows XP and want to maintain compatibility with applications that run on that operating system, Windows Virtual PC provides an easy way for you to do this. You can use Windows XP mode to access a virtualized instance of Windows XP that is ready for you to customize with your own applications. Windows XP mode and Windows 7 allows you to run applications seamlessly in Windows 7 while the applications are installed in the Windows XP virtual machine. Windows XP runs on the 32-bit and 64-bit editions of Windows 7 Professional, Windows 7 Enterprise, and Windows 7 Ultimate. This article will show how to setup your test environment and demonstrate how to try out some of the other key features of Windows Virtual PC, such as sharing of physical resources (USB devices, printers, and hard drives). Ensure that the computer you’re going to install Virtual PC support virtualization - specifically processors with Intel Virtualization Technology (Intel VT) or AMD Virtualization (AMD-V) technology. You may need to enable this in the BIOS. Check with the manufacturer of the computer whether a specific processor model supports hardware-assisted virtualization. To use Windows XP mode as described in this article, you must download the Virtual Windows XP package. This package is used to setup and configure the virtualization environment that Windows XP mode will later utilize. The Windows XP mode package for Virtual PC is available for download from the Windows Virtual PC product page http://go.microsoft.com/fwlink/?LinkId=148103. Before we can take advantage of Windows XP Mode in Windows 7, we must first install Windows Virtual PC and set up the virtual machine. Double-click the file you downloaded, Windows6.1-KB958559-plaftform.msu, where platform is either x86 or x64. Review the end-user license agreement and accept it to install the update. After the installation is finished, Windows Virtual PC is available from the Start menu. Once Windows Virtual PC is installed, you must now setup the virtual machine. At this point you can either use the Virtual Windows XP feature, or create your own customized virtual machine. 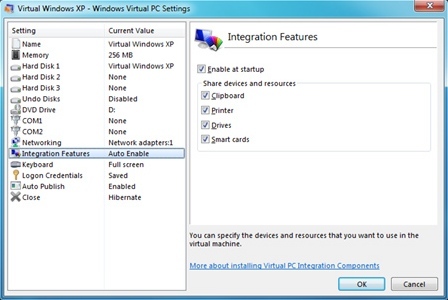 Integration components also improve the mouse sharing between your host and guest Windows XP.